Fashion literally takes on a whole new look with the current hot trend to change eye color as often as you change your clothes. Celebrities like Paris Hilton are using colored contact lenses for cosmetic purposes so one minute she has brown eyes and the next blue. If you would like to do the same, here's some information on what's available and most importantly, some advice on eye safety so that looking beautiful doesn't affect your ability to see properly. You don't have to be short or long-sighted to change your eye color as colored contacts without prescription are also available for anyone to wear. If you have dark eyes eg. brown eyes, then you need to look for colored OPAQUES - lenses which completely change the eye color. If you have light-colored eyes eg. pale blue then you can either wear opaque lenses for a complete color change or you can choose ENHANCERS to lift or brighten your natural eye color. PLEASE remember that if you don't need contacts for vision correction you STILL need to visit an optician to have your lenses FITTED and get the correct advice on cleaning/storing your cosmetic colored contact lenses. Colored lenses, whether opaque or enhancing are available in a wide variety of colors. 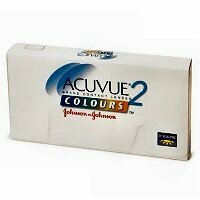 Acuvue 2 Colours, one of the most popular and affordable lenses on the market, comes in 3 shades for enhancing eye color (Aqua Marine, Ocean Blue and Emerald Green) and 7 opaque shades (Chestnut Brown, Sapphire Blue, Hazel Green, Jade Green, Pearl Gray, Warm Honey, and Deep Blue. The growing trend for cosmetic colored contact lenses includes fun fashion contacts for fancy dress parties and major holiday events like Halloween. There is a mind-boggling selection to choose from including lenses with smiley faces, blood-red Dracula contacts and mirrored contact lenses for the Riddick look. You will only find a small range of fun contact lenses at your local optician and many reputable optical retailers only stock a limited range of FDA approved lenses. But a quick search online will reveal hundreds of websites offering very cheap cosmetic colored contact lenses for Halloween, Christmas parties and general fancy dress. My advice is to choose your retailer and brand carefully and read our related pages like this one on cheap Halloween contacts to avoid the dangers of cheap plastic contacts that could damage your eyes.